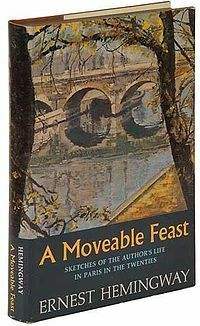 A Moveable Feast by Ernest Hemmingway. Image from Wikipedia. There are a lot of theories on how to write, and a number of different methods. This was highlighted in Hemingway's A Moveable Feast. He wrote the 'one true sentence', editing and perfecting as he went. Fitzgerald poured out words, to go back later, many, many times, to edit. Somerset Maugham suggested finishing a writing session mid sentence, so you had a prompt to continue with the next day. Do you have any advice you swear by? What's the best writing advice you've ever been given? The best advice is whatever works best for you. Everyone has their own style of doing things. I edit as I go along because I feel depressed if I don't think it is right. One thing we must all remember is that we are bad writers, but good rewriters. The first draft is always going to be poor. It is the editing stage where the good stuff comes out. I'm not sure where I learnt this, I think it might be roughly based on the Snowflake Method, but basically I write as much as I can to get it all down on my computer - even if that means writing scenes out of order - and then once I've written all I can I make a plan and write down each scene and how it will play out. I sometimes draw diagrams like a flow chart and sometimes I'll even just write the name of the chapter. I find naming each chapter even if you don't plan to keep the chapters the way they are gives you a mark - something to follow and refer back to. I do like to stop while I still have something to write about (not actually in mid sentence, but mid paragraph maybe) so it keeps percolating in my mind overnight until I come back to it. I try not to edit too much as I write because I lose track of the big picture that way. Nanowrimo has helped a bit with trying to break that habit. Instead I like to try and get down everything on paper and come back to it later. One big hurdle was getting past wanting to stop writing because I felt my work was rubbish. I had to learn to accept that it will start out rubbish and get better with editing and that it's the same even for the greats. I remember one of my uni lecturers saying, and I forget who he was quoting, "you can edit s*** but you can't edit nothing." Sometimes I build on an idea until I'm satisfied the story is solid enough to edit. Other times I go for it, pouring everything out, then putting the manuscript aside until a decent amount of time has elapsed before launching a delete key attack. Either way a large amount of editing and refining is involved and the best advice I received is "Kill your darlings" meaning don't be too precious with your words. What do you make of the ending of All is Lost?